I’ve been waiting to review this one for a long, long time! Immediately after watching El Laberinto Del Fauno I put the film in my top twenty of all time. That was a rash decision, one that I was given a good amount of grief over. Each time I return to El Laberinto Del Fauno that decision is justified, the film remains a top of the line endeavor. I still get the same feeling of intensity and wonderment that I had in a dark Barrington, Illinois theater back in 2006. It may sound cliche to say it, but my eyes were just as glued to the screen on this viewing as they have been in every other viewing. El Laberinto Del Fauno is an immediate viewing experience, it is a complete viewing experience, it is a great viewing experience. When I used to talk about El Laberinto Del Fauno most of said talk centered around the ambiguity of the story. Is the fairy tale real or is it all in Ofelia’s head? This time around my wife made an interesting point, it doesn’t really matter whether it’s real or not because it’s real to Ofelia. I still fall in the camp of the fairy tale being a product of Ofelia’s imagination, and my wife agrees, but I was struck by my wife’s words about the fairy tale aspect being real to Ofelia. The fairy tale world is Ofelia’s escape (I’ll get into the nastiness of the fairy tale world further down) from the harshness of the everyday world around her. The fairy tale needs to be real to Ofelia because it is the only way she can truly escape. An easily deconstructed illusion will not serve Ofelia’s purposes, and thus the film constructs a real fairy tale land so that we can feel the same reality that Ofelia does. One could argue that the fairy tale land Ofelia creates is too harsh, but I don’t see that argument. The world around her is harsh and it only makes sense that her fantasy land escape would be just as harsh. We put what we know into our fairy tales, Ofelia knows brutality and desperation. Those traits inhabit her fairy tale world because that is all she knows, the nastiness of the real world has to be a part of her fantasy creation. Creation is where Guillermo del Toro most shines in El Laberinto Del Fauno. The obvious path for this thought to go on is the creation of the creatures and the visual style. Those are the strongest aspects of El Laberinto Del Fauno, that is what most people choose to write about when discussing El Laberinto Del Fauno. Senor del Toro creates something else in El Laberinto Del Fauno, he creates atmosphere and texture. He uses his visuals in combination with the score and the voices of actors to create an atmosphere that hits the viewer like a waterfall. From the onset El Laberinto Del Fauno is a movie with some heft to it and the atmosphere is mostly to thank for that heft. The atmosphere is backed up by the texture that Senor del Toro brings to the picture. The violence in El Laberinto Del Fauno is real. When Captain Vidal is stitching up his face I could feel that thread going through my own face. When the thin man demon, or gollum as my wife describes him, is moving I can feel his bones creaking and his skin hanging in the air. I could feel El Laberinto Del Fauno, this is a film with a definite texture about it. The one area where my wife disagrees with me is in my description of El Laberinto Del Fauno as a horror fantasy. She sees the film as a straight up fantasy or fairy tale. I am of the mind that Senor del Toro is playing on certain horror beats. The man standing ominously in the shadows, the monster under the bed, and the horror of our dreams (I realize no one truly dreams in El Laberinto Del Fauno, but in this case one could substitute Ofelia’s fairy tale land for the world of dreams). These are definite horror elements in my book and Senor del Toro implements them into his film in fine fashion. I agree with my wife, El Laberinto Del Fauno is definitely a fantasy/fairy tale, but I found it to be entrenched in the world of horror as well. I could write about El Laberinto Del Fauno for days and days, it’s a film that gives me a lot to write about. I barely touched on the score, I didn’t go into any detail about the real world horror aspects or the excellently created real world. There is some tremendous acting in El Laberinto Del Fauno, and so on, and so on. I originally put El Laberinto Del Fauno in my top twenty of all time, and it still resides in that same grouping. My rankings aren’t a reason for you to see the film, but my words of praise should be. El Laberinto Del Fauno is a one of a kind horror fantasy, blending a sense of immediacy with a texture that is omnipresent. El Laberinto Del Fauno is one of the best movies ever made, and it remains a tremendous viewing experience. This entry was posted in 2000s, 400+ Word Reviews, Guillermo del Toro, Mexico, Spain, United States Of America and tagged 2000s, drama, fantasy, horror, mexico, spain, united states of america, war. Bookmark the permalink. I think that when a movie is as complete as El Laberinto del Fauno, one doesn’t need to spend too much energy on deciding what genre is belongs to. The film delivers the whole package, with enough story, imagination and thrills to satisfy just about anybody. It is a film almost for all ages (maybe the really young ones should shy away for a later date in time). It can be considered del Toro’s most complete film. Oh, and your wife is right. It was more of a thought to engender discussion between the wife and I, not a serious source of energy usage. I too would consider it del Toro’s most complete film, and we can’t wait to show it to our daughter when she is a few years older. Of course I am right 🙂 And I truly fell in love with this movie. I am not a person who enjoys unnecessary violence or gore, and I felt that this film did not have any of that, which I know some people would disagree with. Like Bill said, I am really looking forward to sharing this experience with my daughter, not quite yet maybe since she is only five. This movie was visually amazing, I was completely in awe over the fantasy characters, every single one was remarkable! I don’t rate all of my movies the way Mr. Bill does, but I am certain this movie easily made my top ten list if I were to actually rate them all in order! Great write-up, Bill. Pan’s is a film I appreciate – I agree it’s brilliant – but it’s sort of one of those films that’s so painful I have a difficult time loving it. I have, perhaps, seen more horrible films, but this one drives so deep; the fantasy deepens and makes more poignant the painful reality in a way, if that makes sense. One thing you might find interesting (you may know this already): the original fairy tales, Grimm’s, Hans Christian Anderson, old folktales, etc. are often very, very dark. The bad characters meet gruesome deaths, but not only that, oftentimes, the protagonists don’t survive. “Babes in the Wood” is an example; I remember when one of my daughters, who was reading her way through one of our collections of tales (unabridged stuff, not sanitized) and she finished that story, she looked rather white and shocked, and she said simply, “They died, Mama. They died.” Yes, they did – there was no happy ending. I think, that while Disney movies have their place – I won’t say I don’t love many of them – we’ve forgotten that fairy tales are or can be so dark, not always reflecting happy endings, but coming much closer to painful truths about the world. Much like Del Toro does in this film. Melissa, I definitely see your point about the film driving so deep. I think that’s one of the reasons that I can go back to the film so easily, it does drive deep for me as well, but I often seek out that type of experience in my cinema watching. I probably should re-visit it at some point – it’s just so tough! I’ll have to steel myself when I do. Indeed, my wife does have great taste in books. I’m hoping that as soon as her school schedule lets up a bit she’ll start writing more on her blog. I’m with your wife, this is a straight up fairy tale and by fairy tale I mean the old, Grimm style, not our modern Disney coated conception. To me, the fantasy is real. I understand those who disagree, and that’s part of what makes the film fun to talk about, but I think it’s because I see fairy tales as their own kind of transcendent reality in a way. I think the fact that people can interpret the fantasy as either real or imagined and be secure in their beliefs speaks to how well made the film is. I think the fantasy is imagined, but I can understand people who think otherwise. Great review of one of the great films. Pan’s is one of the great imaginative films of our time. If there is one thing I hope most people would latch onto with the film it is its imagination. Good point Steve. An excellent film that has so much depth for what is ostensibly a fantasy-horror. I would say Guillermo del Toro’s best film and it deserves to be in your top 20 films. So far it’s definitely what I would peg as del Toro’s best. But, the man has so much imagination and visual skill that I’m not ruling out him coming out with an even better movie before his career is finished. This is a movie with a simple and straightforward plot which contains layers and layers of intelligent writing, metaphors and message. To speak further about the script will end up in spoilers and that would be pointless since my very purpose writing this review is to encourage people to see it. This is no small feat, interpreting fantasy as something of a product of a real world, cross-referencing how the child acts to her real surroundings and the “other world”, metaphors that describe the accelerated state of growing up some of us are put through… Incredible. Simple, straightforward yet there is so much to be appreciated. Those who are saying how it’s predictable and thus not enjoyable, I ask of you, which movie nowadays aren’t predictable? Hell, even 21 grams was predictable but so damned good. It’s not about how it ends, you can always predict how a movie would end if you’ve ever taken a half-decent script writing class or have some common sense. It’s always about how well you tell a story. I’m grateful there are still directors who aren’t tied down to this new epidemic of including a plot twist simply because they need a plot twist. 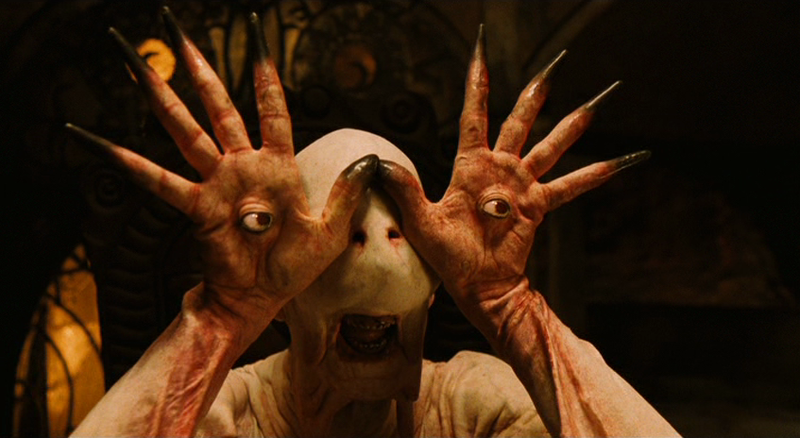 Pan’s Labyrinth features some of the best storytelling and attention to detail without being affected by the now ever-popular opinion of cameras having to be put through several technical difficulties to make the shots eligible to be called a brilliant shot. I am also grateful for them not dubbing it. Watching it in its’ original language is much, much more rewarding even if I had to rely on the subtitles for most of the time. This is a brilliant movie. Watch it. Yep, it is a great one.